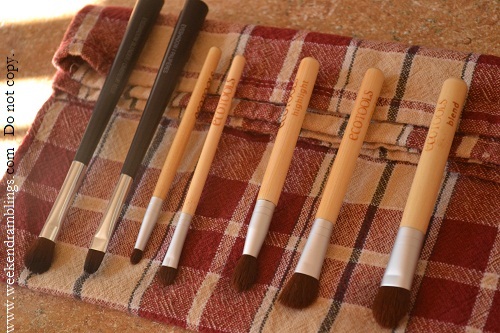 How often do you clean your makeup brushes? I don't have any fixed routine I follow, but I did wash them out today and as I was putting them on the towel to dry, I thought I would check with everyone else on this. I take about a cup of lukewarm water - not really very warm but definitely not cold - and add about a teaspoon of shampoo to it and mix it up. brush to fall in or lie completely inside the water. Insert only about halway up to the length of the ferrule (the portion holding the brush hair) into the cleaning solution. Make sure never to put the whole brush into the water. 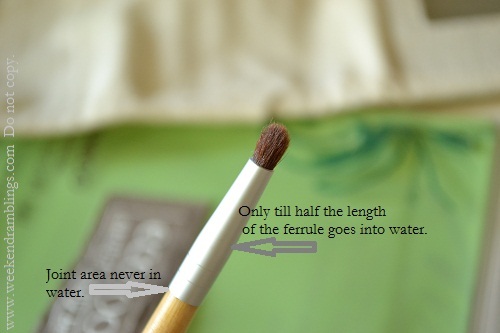 Also, make sure that the joint where the ferrule meets the brush handle is never in water since this makes the joint weak and it can come off. Of course, you can always just glue it right back on but err..better to avoid that to start with. Rub the brush hair gently with fingers while it's in the liquid to help dislodge any makeup residue. Swirl the brush gently around, take out, squeeze out any remaining soapy solution from it. Wash off in fresh clean water. I never follow with a conditioner - one because I never felt any need to, second because, again, I don't want unnecessary residue on the brush. After washing and gently squeezing off water from the brush, I lay them to dry on a towel, and in a sunny spot if it is available. I lay them at an angle with the brush pointing downwards and the brush handle slightly higher. This way, I can be sure the water drains down from the brush head into the towel and not go upward into the brush itself. Water can dissolve the glue that holds the brush hair together and ultimately ruin the brush. 1. Use any inexpensive makeup wipe/towelette that I don't mind wasting. Wipe the brush head on it and clean brush in an instant. I do this quite often with my eyeshadow brushes to take off darker colours. 2. MAC Brush Cleaning Solution - this is just as easy as the makeup wipe method, but of course, this is much more effective. Pour a few drops of the solution on a clean paper towel, rub the brush into the wet paper and keep wiping the brush on this wet patch. Alternate between wiping on a clean dry paper and wiping on the wet paper. Your brush will be squeaky clean in no time. So what about you? What's your brush cleaning routine? I wash brushes whenever i feel the need to. 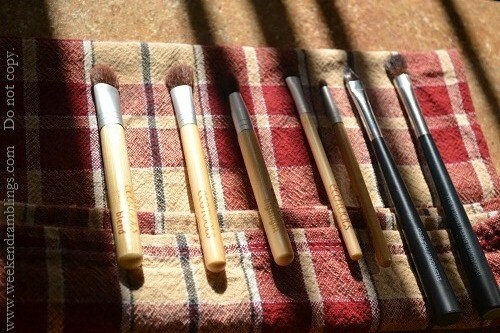 Foundation / concealer etc brushes after every use. eye makeup brushes depending on how much i have used. that mac brush cleanser is my god. :P :P I clean my gel liner brush after every use with this and may be once a week. Hawwwwwwwwwwwwwww....Ecotools also is flaunting!!!! You all wait...I will get MAC brushes and put nekkid photeees with it hmmmmmmmmmmmph.